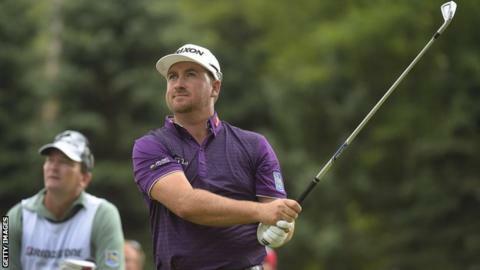 Graeme McDowell has an outside chance of winning the WGC-Bridgestone Invitational after a one-under-par 69 in the third round at Firestone. The former US Open winner from Portrush is four under for the tournament in Ohio and five behind leaders Justin Rose and Jim Furyk. McDowell slipped back with bogeys at one, two and eight but recovered to birdie the ninth and 18th. Ireland's Shane Lowry is just two back in third place following a 67. World number two Jordan Spieth has much work to do if he is to claim a victory on Sunday and replace Northern Ireland's world number one Rory McIlroy at the top of the rankings. The 22-year-old carded a double bogey on the 18th to shoot 72 and is nine shots off the lead.